You are seeing this message as a result of technology — we recently upgraded our website to a brand new web platform, and because of this, many of our old links are no longer valid which is why we created this redirect. My guess is that you found this page through a search engine query, image search, or maybe an old link on a forum or something like that. The good news is that the image or info that you searched for is likely still on our website somewhere, just with a different url. The best next move is likely our SEARCH PAGE — just enter a few specific search terms, a name, an event, etc., and I’m sure the result will be in line with what you are after. 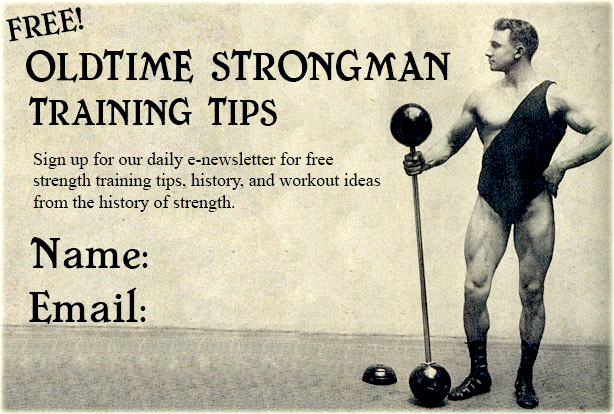 It would also be an excellent idea to check out the newest iteration of our Oldtime Strongman Blog, a link for which is provided below. There you will find many old posts and also plenty of new material — we add new posts on a regular basis. Of course, you can always CONTACT US if you have any other questions.